First up I have the Santa's Christmas shower cream from Lush. I used to own this scent but in their lip scrubs and I loved it. It smells of Coca-Cola! It's such a delightful scent especially if you are a fan of the soda. It contains a warm blend of cinnamon and black pepper. I quite like the shower creams because it is a lot more hydrating on the skin compared to their shower gels, although I'm a fan regardless. It contains cocoa butter and almond butter for that soft to the touch feel. I believe this scent is only available for the Holidays so don't pass up going into Lush to check it out. 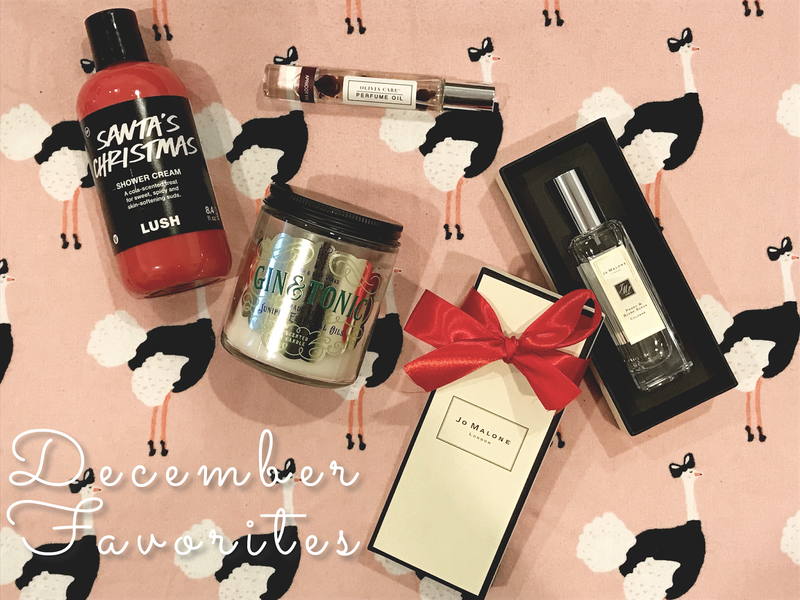 They have so many great scents available for the Holiday season, and once the season is over, they're only available while supplies last. I've been really enjoying this Olivia Care roller ball perfume oil in Apricot Fig that my friend Cam sent me for Christmas. This perfume smells amazing, I'm so in love with its scent. It smells sweet, juicy and fruity in the best way. It's so intoxicating, and definitely not an overpowering scent either. Very delicious! I'm constantly applying this to me even after I shower and at night before bed. I want to smell like this all the time! I love how the bottle contains baby rosebuds inside it's so precious. I've never owned a perfume oil and I've been enjoying this one a lot. Another perfume that I have loving this month is the new addition to my perfume collection and it's the Peony & Blush Suede cologne by Jo Malone. This fragrance is different than the other Jo Malone colognes I own it's very floral. It smells very fresh, clean and like a garden of peonies. Now imagine how lovely that smell would be. Peonies have become one of my favorite flowers this perfume really brings that beautiful scent of them. I've been wanting a true floral fragrance to add to my collection and this one is pure perfection. The keynotes are; red apple, peony, and suede. Even though we're in winter I'm still wearing this as much as possible. It will be the perfect signature scent for spring and summer! During my visit back home I picked up a couple of candles from Bath & Body Works and one of the candles I've been burning this month is their Gin & Tonic. I liked how this candle smelled but couldn't decide if I wanted to take it with me. Rudy really liked it so we added it to our bag. The notes to the candle are so simple 'Juniper essential oils', I don't even know what that exactly smells like Nonetheless, the candle smelled really good. Since lighting it in our room I've fallen in love with the scent even more. It smells of Christmas! (It smells of pine mostly to me.) The throw to this medium candle is amazing and I've been lighting it close to every day for a few hours and it's lasting a long time. It hitting the halfway mark. I would love to pick up another of this candle whenever they go on sale for $5, and I hope it's soon. This next favorite is different than my usual. For the longest time, I was never really a fan of flannel bedsheets. However, since moving to Washington and experiencing the colder weather, flannel sheets is something I absolutely love now. They're so handy for the weather here and keep me warm and cozy. I specifically wanted to talk about this new print I recently picked up. It's from the Pillowfort brand at Target and it's this Ostrich flannel sheet set. It's so adorable I fell in love with it when I first laid my eyes on it back on Black Friday. I didn't purchase them then because I wasn't too sure if Rudy would enjoy sleeping in a girly-ish bed, but it turns out he doesn't care haha. I got lucky too because when I came across them in the store they ended up being on clearance for almost half the original price.